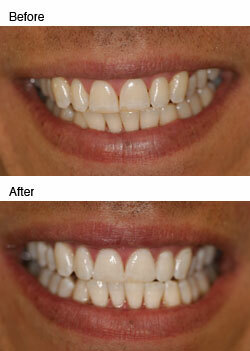 Tooth whitening is a procedure that lightens teeth and helps to remove stains and discoloration. Whitening is among the most popular cosmetic dental procedures because it can significantly improve the appearance of your teeth at much less cost and inconvenience than other techniques. The majority of dentists perform tooth whitening. Every day, a thin coating forms on your teeth and it picks up stains. Also, the outer layer of each tooth, called the enamel, contains pores that can hold stains. Whitening is not a one-time solution. It will need to be repeated periodically if you want to maintain the brighter color. The most common reasons for yellowing or stained teeth are aging, tobacco, tea and coffee, which can stain the surface of the teeth. It is also possible to have stains that are inside the tooth. These are called intrinsic stains. For example, intrinsic stains can be caused by exposure to too much fluoride as a child while teeth are developing. Other causes include tetracycline antibiotics taken during the second half of pregnancy or given to children 8 years old or younger when the teeth are still developing. Tooth whitening is most effective on surface stains caused by age, foods or drinks. Whitening is unlikely to cause serious side effects, although some people;'s teeth may become more sensitive temporarily. There may be mild gum irritation as well. Whitening procedures should not be done while a woman is pregnant because the effect of the whitening materials on the development of the fetus is not known. Since the procedure is cosmetic and option, it should be postponed until after delivery.